I am so happy to bring you this review of UnLock Math's UnLock Pre-Algebra. 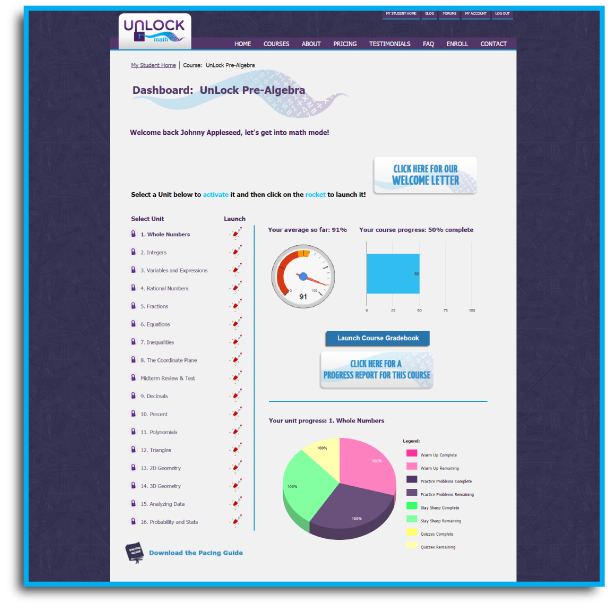 UnLock Math's UnLock Pre-Algebra is an online homeschool math curriculum that is intended for students on a 7th grade pre-algebra level. Taught by Alesia Blackwood, UnLock Pre-Algebra helps to reduce math anxiety in students who are "Mathaphobes." UnLock Pre-Algebra helps students develop a greater understanding of math concepts, starting from the very beginning of whole vs. natural numbers, to set a strong foundation in math comprehension. While UnLock Math is intended for students on a 7th grade level, Mr. B is only in the 5th grade. He is very advanced in math, so I would suggest making sure your child is definitely on a Pre-Algebra level. How we used it: When I received our log in information I sat down and started getting our account set up. There is a parent login and a student login. From the Parent Login, you assign courses to your students. For us, we received UnLock Math UnLock Pre-Algebra so that is the only course we had to choose from. If you have multiple students, then your options there will vary. I wish there was an option to view your child's progress from a parent screen, with out the need to go to the child's screen. I also wish parents had the option to reset areas they feel their child could have performed better, and not have the grade impact the overall score. Sometimes, especially in the world of special needs, our kiddos just blunder through to get finished. It would also be a GREAT asset to have printable worksheets available. From the Student Login, you have the course work. I like how there is a graphical representation of the grade. Mr. B liked the gauge showing his grade. I also like how the student can see what is coming up, and when. When you choose your unit, and click the rocket to unlock it, you are taken to a page that gives you a lot of options. This is where your student will choose what activities they will do for that lesson. For this review, I chose the first option to show you. Once you choose your lesson option, you are then taken to your video and work. There is a warm up section in the top right corner that I did not include in this screen grab. I very much like how there is a map of sorts for your student to follow. This was a visual road map to keep Mr. B on task, and is an invaluable tool to help special needs learners to navigate and stay on task with minimal redirection. You first watch the video (after doing your warm up) then you go on to the Practice Problems. Your practice problems are scored after each one, so the student is provided an instant score. You must click next to move on to the next question. If your child needs a break, they can click save and it will save their work. As far as the work, it is challenging, but not boring. There are a lot of real life questions. I like how it makes Mr. B stop and think. He can't just enter in a number. He has to stop long enough to choose the proper symbol before the number. And he has to stop in think in steps. That is a great benefit for ADHD since often times, he doesn't really stop to think things through enough. I really like the Self Challenge problems. They are a lot of fun, and are very critical thinking based and thought provoking. The student area will also provide a grade report. This particular screen snip shows what happens if you merely click submit and not quit and save. Mr. B. is just beginning 5th grade, but he has always had a strong skill in math. Math has always been one of his favorite subjects (with the exception of subtraction.) With that said, if your child is very advanced in math, UnLock Math UnLock Pre-Algebra is taught in such a pleasant way that it is appropriate for younger than 7th grade students. The instructor on the video is very energetic and has a great love for teaching math, and it shows in all of the videos. She grabs your attention! Mr. B responds well to video instruction, and this is no exception. The videos are not long and drawn out, so they are ideal for kids who may need more frequent breaks or who have a hard time with attention span. The work is adequate and appropriate for a course of this academic level, and apply real world ideas, which alleviates the question "When will I ever need to know this?!" There are a few things I would change, that to me would make this program better. I would also change the grading set up. Mr. B does very well with his work, but the way the grades are calculated it looks as if he only has a grade in the 70's, until he completes a set. That's disheartening for him. It would also be nice to receive an email when he completes a set, and have the grade received for that set included in the email. Worksheets would be a GREAT bonus! I love to reinforce what we are learning with good, old fashioned pencil and paper work. I think the option of printing worksheets would be a great addition to this program. The "Challenge Yourself" section is GREAT! We love it. I would like to see more questions in that section. Overall, we really like UnLock Math. The layout is nice, and I like the "path" that is a visual reminder of what needs to be accomplished for the day. The folks behind UnLock Math are VERY nice, very understanding, and eager to make sure your math experience is a positive one. Does UnLock Math Pass My 4 Ingredient Test?1.) Customization: Is it easily adaptable? Can we customize it to fit “us?” Can we modify or set our own schedule? Can we take breaks, jump ahead, or flat out skip? There is no timed schedule or anything like that, but you need to complete one section before going on to the next. There are no hidden fees, but you are locked into the one specific grade level that you choose for your child. Each child can have their own account that you pay for, but they are locked into their grade. You will cover a year's worth of the grade. The videos are short and sweet. They are not long, drawn out, or monotonous at all. They are long enough to cover the given topic, but short enough that Mr. B never lost interest. So that is great for Autism and ADHD. There is variety in the type of assignments online, but I would like to see the addition of worksheets. As of right now, the exams are sort of long in length at around 50 questions for an exam. You CAN save and come back, so keep that in mind. There are plans to go back and remove some of the questions to shorten the length, but that is going to take bit of time. So in the mean time, just plan that factor into your class work. UnLock Math does a GREAT job of making sure the math your student is learning is applied in a real work manner. As you can see from the examples I posted above, the questions are questions that can pop up in real life. I really like that! If you'd like to read more reviews, please visit the Schoolhouse Review Crew by clicking the banner below!